If you have Navel orange trees, the crop will be ripening. Oranges left on the tree too long will dry out and become inedible or get eaten by rats. Instead, harvest the entire crop by the end of April and use the bounty to make marmalade, chutney and spiced oranges. QUARANTINE WARNING: Most of Santa Clara County is under quarantine for citrus due to the asian citrus psyllid and huanglongbing disease. Check the Santa Clara County Quarantine Map to see if you're affected and review our asian citrus psyllid page for what can and can't be moved across quarantine boundaries. The clay soils which dominate our area are particularly susceptible to compaction, especially when they have received a lot of rain. These soils are characterized by small mineral particles. Hence squeezing out the air spaces makes it more difficult for plant roots and soil organisms to get the oxygen they need to flourish. Try to avoid walking on or using heavy equipment on soil that is wet. Digging in wet soil can also destroy the structure, breaking up useful soil aggregates and earthworm tunnels. Try to wait until the soil is moist, not wet or dry, for easiest tillage. If you must walk or stand on the soil, use a board to distribute your weight over a broader area. Mulch can also create a bit of a cushion and help minimize compaction. Worm composting also called vermiculture or vermicomposting is a convenient way to decompose kitchen waste and provide nutrient-rich soil amendments for your vegetable garden. Here is a description for Getting Started. 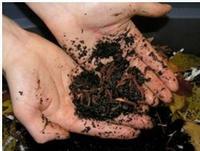 The Santa Clara County Home Composting Education Program offers Worm Workshop classes. The last part of February is the time to prune fuchsias. There may be some frost damage so prune that out. Also take off some of last summer's growth. Leave at least two or three healthy leaf buds on each branch. Fuchsias have a tendency to get leggy. Frequently pinch the tips of the branches during the spring and summer to force side growth, making the fuchsia bushier. Pick off flowers as they fade. Check out the American Fuchsia Society's website for more information. When cutting large limbs, take special care to prevent ripping of the limbs and trunk since a clean cut heals faster. Use a three-cut method for branches larger than 1" diameter. Step 1: make a cut halfway through the underside of the branch, a little past where you want the final cut. Step 2: move the saw to the top of the branch, a little further out on the branch, and cut the branch off. Step 3: make the final pruning cut close to the connecting branch or trunk, just outside the bark collar. For more helpful information view UCCE Tips for Pruning Citrus. Worms aerate the soil with their tunneling, break down organic material such as fallen leaves and make the nutrients available to plants, and they excrete nice rich fertilizer in the process. They help create a sustainable system in your garden and do a lot of your garden chores for you. If you see them on the sidewalk during heavy rains, rescue them and take them to a safe place in your yard. If your shrubs have become too large for their allotted space, you may be able to resize them rather than replace them. Many woody shrubs can be cut back to within a few inches of the ground. These include Buddleia (butterfly bush), Artemisia (wormwood), and Salvia leucantha (Mexican sage). Maybe worth a try before replacing the plant! You may notice your house plants leaning towards the windows. A good way to keep the growth uniform is to rotate them a quarter turn every time you water. And don't water so much that you're seeing lots of yellow leaves and gnats. Look at UCCE Guide for Care of Indoor Plants for more information. Once your apple tree loses its leaves, it's time to think about pruning. Apple trees produce fruit terminally on spurs located on wood 2 yrs. to 8 yrs. old. Weak and unproductive branches should be thinned out to allow the sunlight into the tree for good spur development. Older spurs can be rejuvenated by cutting back, especially following a light crop year. Tree height is maintained by cutting back upper branches to shorter laterals. Excessive pruning of a bearing tree can negatively affect its vigor and fruit. Consult our Fruit Tree Pruning page for more information. Remember to keep your pruners and loppers sharp. Good pruners use bypass blades rather than anvil type. Anvils have only one cutting blade and one flat blade which can result in "smashing" the plant material. Sterilize the pruners or loppers between each plant and after cutting off any diseased plant material. Use a 10% bleach solution (1 part bleach, 9 parts water) or disinfectant bathroom cleaner. According to UC's Backyard Orchard website, "the optimum time of year to prune fruit trees is the dormant season, December, January (best) and until the middle of February." Apricots are the exception for pruning in January; they should be pruned in the summer after harvest. If you properly prune and care for fruit trees you will get the highest yield of fruit. A good rule of thumb is to prune plum, pluot, apple, and pear trees 15-20%; and peaches 50%. January is also a good time to prune roses. A basic guide is to keep 3-6 strong, healthy, outside canes per plant and leave 3-5 buds on each cane. Cut on the diagonal ¼ inch above an outward-facing bud. More information is available at UC Pest Note on Roses: Cultural Practices. The San Jose Heritage Rose Garden offers free hands-on pruning classes every Saturday in January and February. Deciduous trees can be pruned anytime during their dormant season (in winter). Prune deciduous species, such as Western spice bush, creek dogwood, Western mock orange, red-bud, maples and deciduous oaks. Do not prune apricot and cherry trees in winter because they are susceptible to Eutypa dieback. The best time to prune them is late August before the rainy season starts. While you're outside pruning, remember to pick up any rotting fruit on the ground at the same time. Make your cuts with care in order to direct the growth for next year. To have an open tree with good air circulation, make cuts above outward-facing nodes. Choose nodes where you want new growth and make a cut about a quarter inch above, refer to the image below. 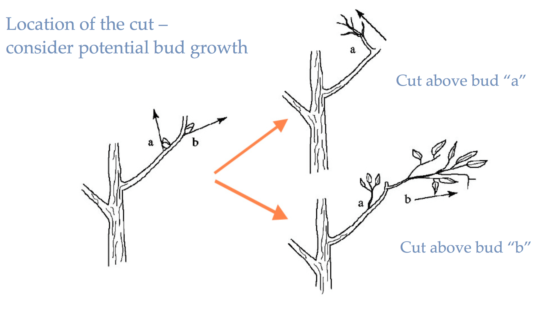 Also refer to our page on fruit tree pruning page. The positive side of cold weather is that fruit trees native to colder climates, such as cherries and blueberries, may get the chill hours they need to produce good fruit. Going dormant saves energy which can then go into fruit development. No need to protect them on cold nights. Knowing the native habitat of your plants will guide you in caring for them. Mimicking the success of nature leads to greater success in your own garden. Learn more about chill hours on the UC Fruit & Nut Information website. When pruning dormant fruit trees, you may want to save cuttings (scions) for later grafting onto other fruit trees. Grafting is a technique that allows you to have multiple varieties of compatible fruit on one tree and is a great space saver. Fruit trees can have new varieties grafted to them when they are dormant in January and February. Scions are available in January at the California Rare Fruit Growers (CRFG) scion exchange. Their January event also includes training classes. Check the CRFG - Santa Clara blog for the date. Winter is a good time to cut back perennials and bunch grasses. Perennials such as hummingbird sage and most kinds of hummingbird fuchsia can be cut back all the way to the ground. Perennials like daylilies and chrysanthemums can be divided during this time. Bunch grasses such as purple needle grass (official California state grass), Idaho fescue and deer grass, and some perennials like douglas iris, alum root, seaside daisy and yerba buena, can be propagated by division this time of year. Depending on the fall weather and rain frequency you will likely set your sprinklers to water less frequently or even turn them off for a while. It's still important to check outdoor plants to make sure they have enough water. While they need less water when it's cool, it's important to make sure they don't dry out. If you have a lawn and rains haven't come, irrigate the lawn once or twice this month. If it has been raining, the soil may be saturated so be careful if you have to walk on it so as not to compact it. Also if soil is waterlogged, vital space for air that is needed for plants and worms and excess water can drown beneficial soil organisms and contributed to rotting roots. Bare root plants are sold without any soil clinging to the roots making them easier and less expensive to transport; they'll do just fine in the garden as long as you don't let them dry out before planting. Because you can see the roots and can control how they're placed in the soil, it helps reduce the chances for root girdling problems later. Buy and plant early in the month while roots are still fresh. The bare roots should be soaked from an hour to overnight (large plants) in a bucket of water before planting. Trim roots of broken, dead or spongy bits and carefully pull the roots apart. Dig a hole that is fairly shallow and wide. Spread the roots out sideways and have the crown of the plant several inches above the soil level. This is necessary as the plant will settle down over time. Water in well but wait to fertilize until you see new shoots growing. Be sure to water regularly if the rains are sparse. Staking may not be necessary. Trees aren't the only plants that are sold bare root. You can also plant bare root asparagus, artichokes, rhubarb, berries, kiwifruit, horseradish, rhubarb, grapes, roses, strawberries, and iris in January. Asparagus crowns can be planted now. Dig a trench eight to twelve inches deep, mix in fertilizer at the bottom and cover with two inches of soil. Set the roots in the trench about 18 inches apart, and cover with two inches of soil. Gradually fill in the trench as the plants start to grow. Asparagus is a perennial vegetable that will produce for several years. It's best to wait until the second year to harvest to let a strong root system develop for long term production. For more information, read UC Davis' Growing Asparagus in the Garden. Starting your own seedlings is fun, easy and can please your taste buds, too. You can select vegetables that are grown for a particular flavor such as heirloom varieties, many of which are not offered in garden centers. This month may be the last month that you can successfully start some vegetables (tomatoes, peppers, eggplants) from seed for transplanting this summer season. If seed starting isn’t for you, consider buying transplants from our Spring Garden Market in April. There are two ways to start your seeds: direct sow straight into your garden or indoor sow. Direct sowing is easy for some plants such as peas and beets—see our Vegetable Planting Chart for more vegetables suitable for direct sowing this month. Tomatoes, eggplants and peppers are best started indoors and then planted in the ground after they are developed and sturdy. Three factors influence germination: water, temperature, and light. Information found on the seed packages will show which conditions are best for germination. Peppers in particular germinate best with high soil temperature (Reference: Arizona Master Gardener soil temperature table). Using a heating pad is one way that this can be attained indoors. When reusing pots for seed starting, prevent the spread of plant diseases by making sure they are clean. Remove any remaining soil and cobwebs; then clean the surfaces with a 10% bleach solution: 1 part bleach to 9 parts water. If you started seeds earlier in the year, March may be a good time to move them into larger pots if they are outgrowing their pots. The soil temperatures outside are still too cold in March for planting summer vegetables in the ground. Blueberries in stores often come from cooler climates like Oregon and Maine, yet there are many varieties that do very well in our area. Blueberries need a more acidic soil than is typically found in our area, so the soil needs to be amended with sulfur (preferably) or peat (less sustainable). Annual post-harvest pruning will stimulate new growth and increase yield. Details are available in a video presentation by a local UCCE Master Gardener. Non-aggressive root systems, no messy fruit, small size, relatively free from pests and attractiveness are some of the things to look for. Some examples are Japanese Maple, Chinese Pistachio (male), White or Pink Hybrid Crape Myrtle, Tollenson's Weeping Juniper, Flax-leaved Paperbark, Strawberry tree and Canadian Redbud. For more information see: Ultra Small Trees for Small Spaces. The hottest varieties of peppers need a long growing season for the pods to ripen. You can give them a head start by starting them indoors from seed as early as January. The outdoor soil is too cold for the seeds to germinate, so you can start them in a warm area indoors and even put them on a heating mat designed specifically for seed starting. More information about starting peppers from seed. Your oranges are ready to pick when they turn a nice bright orange. The ones on the sunny side of the tree generally ripen first. If you don't get to them first, there are critters that will let you know when they are ripe. Snails leave little holes in the outside peel, rats hollow out the fruit, and squirrels carry them off, often leaving partly eaten fruit on a nearby fence. UC Davis offers a detailed table to help identify citrus damage from insects and other pests. Botrytis is gray or brownish fuzzy mold that can attack a wide variety of plants. It likes flower petals, ripening fruits and vegetables, as well as leaves and stems. The spores are spread through the air. It is most severe when there's high humidity and may start forming on decaying matter. According to the UC Pest Note on Botrytis Blight, it is important to remove debris and prunings from the ground. You may even have to pick up flowers daily. Avoid overhead watering. UC also has information about Gray Mold on Strawberries. Snails and slugs are patrolling your garden right now looking for new growth. Our preferred non-toxic method for dealing with them is to handpick early in the morning, or at night by flashlight. They can be saved for your friends with chickens, or crushed in place. If you do use snail bait, those made with iron phosphate are not toxic to pets and wildlife and they work well enough. For a full run-down of which management methods work, see the UC Pest Note on Snails and Slugs.